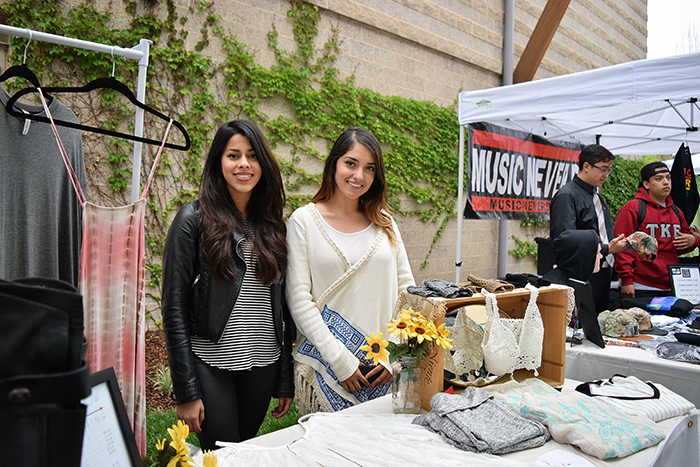 The second annual Market Day at Sonoma State University last week included a diverse range of creative ideas from driven student entrepreneurs. Among the crowded walkway in the Student Center plaza, students set up a number of retail shops, an organic growers coop and other booths to advertise their businesses. "Market day is an outlet for many Sonoma State students to bring their creativity to the table, an opportunity most of them wouldn't have otherwise," says SSU student Adam Loria, chief operating officer for Entreprenoma, Sonoma State's student-run entrepreneurial thinking incubator. While living in an apartment complex or dorm, wouldn't it be nice if there were a way to check the availability of the washing machines before you left the house? Or check if your load had finished from your smartphone? One invention on display at Market Day hopes to accomplish just that. Laundry Now, created by Sonoma State engineering science major Ryan Russell, hopes to revolutionize public laundry areas. While still in early development, Laundry Now can accommodate 32 machines, monitoring their cycles in an affordable and non-invasive manner. Russell was one of 30 student entrepreneurs who set up at Market Day. "What I find truly inspiring is that some 20 or so vendors just popped out of the woodwork without our help," says Kirsten Ely, faculty advisor for Entreprenoma. "It really demonstrates the amazing energy that students have here." One such student vendor not affiliated with Entreprenoma, business major Justin Eterovich, had a strong presence at Market Day. Eterovich designs and sells luxury watches through his company, Blacklist, and boasts $10,000-$12,000 a month in sales. It started when Eterovich bought a luxury watch a few years back and ended up hating it, so he decided to design his own. After a successful Kickstarter campaign raised over $52,000 in just 29 days, Eterovich partnered with a production company in Switzerland and now offers nearly a dozen watch models through his online store.